Let me make sure we're on the same page... When I last looked at this (which may have been before 2006) I understood that as an investor in a company, you are taxed on your dividends as though you "were" a part of the company, so you end up with the same after-tax income you'd have if you actually earned the share of the company's earnings represented by your dividend. 1. Don't tax corporate income. I'm sure investors everyone would love this. 2. Tax corporate income, then make adjustments to each investor's tax returns to mimic #1. Investors everywhere seem to hate this, even though it has precisely the same effect on their bottom line as #1. #1 is what we used to do for income trusts, but that changed a few years ago because we were losing tons of tax revenue due to foreign ownership. Now companies and income trusts are handled by #2. At least, that's what I thought. So I'd like to understand your argument here. Are you saying that what I just described is unfair, or incorrect? @Patrick: I'm saying that in the course of using your #2, the percentages in force right now don't quite work. The tax credit isn't quite large enough to cover the gross-up percentage. The taxes paid (in Ontario) end up being more than you would have if the rules were set to execute #2 properly. Hi Michael, the system does prevent double taxation (corporate and individual) but it is also designed to impose maximum taxation. The first tax cut at dividends happens at the corporation. Any dividends that get passed to an individual then get reassessed and taxed at whatever is the individual's tax rate, which generally happens to be higher than the corporate rate. Investors pay any difference and since corporate tax rates have been falling, you and I are paying more on dividends. That is reflected in rising marginal rates on dividends. 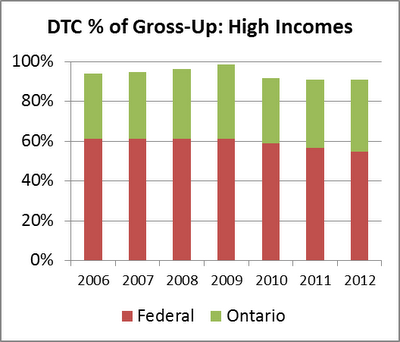 @CanadianInvestor: The system prevented double taxation (up until 2005), but since then, part of dividends do get double-taxed because either the gross-up to too large or the DTC is too small. @Anonymous: With the current gross-up at 38%, you are right except for the fact that the DTC doesn't quite cover the gross-up as I explained in the article. So, the 5.5% interest is somewhat better from a tax standpoint. How much better depends on your income level. Hi Michael, Think you need to include at least one other thing. In 2006 the Fed lower corporate rates and then that moves the bar over to the dividend collector by raising the bar. So in a way its the same amount just a different payer. @McDuck: If this is true, then it is the gross-up that is too high rather than the DTC being too low. No matter what the level of corporate taxes, the gross-up and DTC are out of sync. 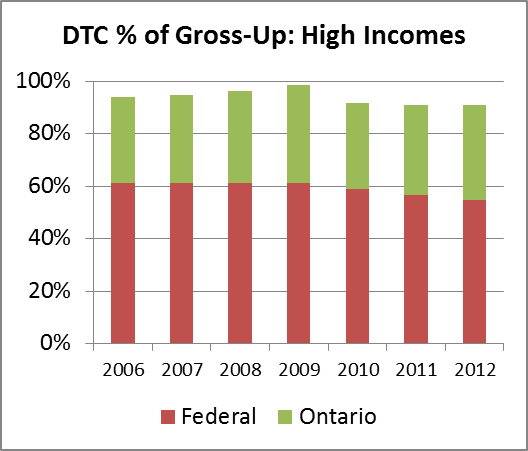 The dividend gross-up is most unfair to people whose income falls into the brackets for "clawback" of social security payments. Those people have to pay back their OAC or child tax credits based on income they never received. @Anonymous: The dividend tax credit mostly makes up for the taxes and clawbacks due to the gross-up, but not completely. The portion of the gross-up not covered by the DTC definitely leads to unfairness with clawbacks. 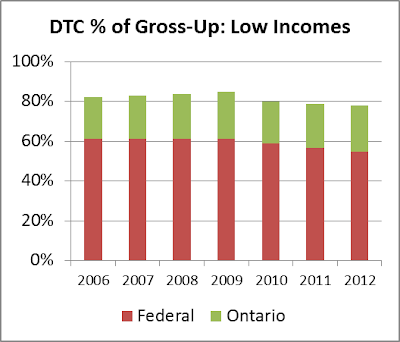 The gross-up also means applying portions of tuition and education mounts to income you didn't receive, and can push you into a higher OHIP payment, again for income you didn't receive.